Ten years ago there were no faith-based units in prisons outside South America. Today, they are spreading all over the world, including the United States, Europe and the Commonwealth. My Brother's Keeper is the first major study of a global phenomenon. Exploring the roots of faith-based units in South America, it explains why the Prison Service of England and Wales set up the first Christian-based unit in the western world in 1997 - and its rapid expansion. It also explains how, at exactly the same time, the United States introduced Christian-based units - and why they were complimented by interfaith and multifaith initiatives. 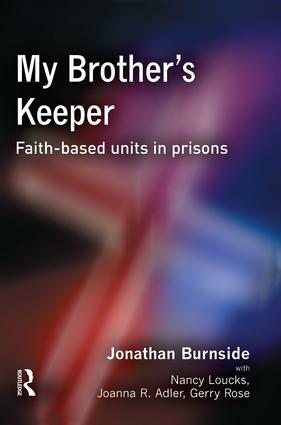 At the heart of My Brother's Keeper is an interior account of life inside four Christian-based prison units in England. It draws on the findings of a detailed evaluation conducted by the authors for the Home Office, Prison Service and Kainos Community between 2000 and 2001, including an updated reconviction study. It is an authoritative account of an innovative programme. Its analysis of what works and what doesn't in faith-based units around the world makes My Brother's Keeper a valuable roadmap for all who care about improving prison conditions. It presents a vision of justice that is not just concerned with building more prisons but with rebuilding more prisoners. It argues that by making prisons more human and punishment more humane, faith-based units can be of value - and keep faith in prisons.